"That's the great thing about books...As opposed to movies, or God forbid, real life- The only thing that matters is how the reader perceives it." Super cute romance that made my bibliophile self squee! I adored all of the bookish bits in this novel; especially, when I'd already read the majority of the books Ben recommends to Hannah. It was like reading the inner monologue I had every time I spotted a cute, glasses wearing guy in my bookstore. Weaver does a fantastic job of maintaining a balance of fluff and nonsense, and emotional turmoil without going overboard and turning the story into a campy feeling romance. I particularly enjoyed watching the growth of Ben and Hannah's characters as the novel progressed. It showed a real development of their characterization, and was nice to be able to come to the end with a pair I had really grown to love. My one major complaint was the way Weaver presented Ben's family. I understand they were meant to be the controlling, everything must be done my way or it's the highway for you, kind of people; but, I found them to be ridiculously two dimensional. Especially at the end of the book. 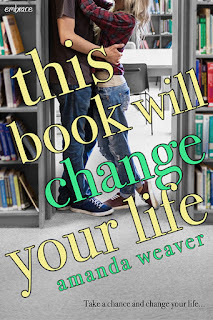 Otherwise, This Book Will Change Your Life is a fun romance, with definite beach reads qualifications, that made me add Weaver to my ever growing list of authors to watch for. -Digital ARC provided by the publisher, via Netgalley, in exchange for a review.